Loved this movie. It’s not gritty or shocking or in-your-face which I kinda expected. It’s nice. Very nice. So sit back and think of it as a fairy tale version of reality…I mean that in a nice way. It’s so rare to get a GOOD script. This was just that. A well-written script with taut writing. I looked up who wrote it…ANTHONY McCARTEN. He is a New Zealander – hooray for our cousins across the ditch! – THAT is why it’s so good. It’s a fresh take. Not from a formulaic weary wizened up old hack who can only write action heroes. Hope you win something shiny, Anthony! It carried everyone along with a really good pace, helped along with nifty camerawork and great editing…even some comic chicken cameos! Emotionally it didn’t really have any great highs and lows but maybe it didn’t need them. There were poignant moments where so much was unsaid that worked beautifully between Freddie and Mary; and between Freddie and his parents. When the script is so tight, you really need good actors to carry it off…happily they did. Rami Malek was superb. Absolutely mesmerising. With the iconic look, mannerisms & charisma of Freddie Mercury. The ending – don’t worry, I won’t reveal it – was too prolonged. Just a couple of songs and then freeze frame would have done just as well. I kept waiting for the final song. Come on, come on, I know it’s about to end, the story is coming to an end, come on…but it kept going. But all in all, wonderfully entertaining. A heartwarming movie. A movie that taps into the human need for friendship and vulnerability and forgiveness. A movie full of music to make you happy – even if you’re not a particular fan of Queen. A really fun movie – watching a bunch of good guys come up with musical ideas, aim high thanks to fearless Freddie, make it in the industry and become a world-wide phenomenon, hey it’s a winner! As Freddie used to say: “We are the champions, my friend”. Saw this last night. Entertaining. A nifty look at cultural misunderstandings, altruism and the cost of genuine caring. We have two white women, a white man, a Sudanese family wanting to stand on their own feet and a Muslim mini-mart owner doubling as a doctor. Audience enjoys it. Laughs at politically incorrect language but probably shouldn’t. Is it drama? Is it comedy? Is it Home & Away? Opening scene terrific. Comedic but misleading. Set-up with lovely Prosper Deng trying to support his family is hilarious but then we never see him again. Wah! A further crucial point I found puzzling. Scene where Maggie brings loan agreement for Amath to sign and Amath looks at document and says something like: what is this? My friend thought she was surprised at being offered the loan. I thought she was alarmed. It was vital to know. Because there is a change of heart from Maggie. She decides to help these people not block them. But why? But enough confusion. Nice intrigue in gradually discovering relationship between Leo and Maggie. And who the dude in hospital was (I thought at first it was her father…) And seeing the transformation of Benny was heartbreaking but somehow not quite believable. Maybe the attack in the mini-mart needs a rethink. Either fully naturalistic or nightmarishly surreal. It seems it was neither. Set is busy. Do we need four painted sections on the floor supposedly representing four places? Do we need LED light sign telling us where the action is? Do we really need to be told we are now at the Deng Home? It’s all very clear. No signalling required. Towards the end of the play, there is an over-reliance on overly-dramatic music. Benny is left sprawled on floor…we don’t need drastic light changes and metallic music to make us feel something. Or do we? I hope not. Some aspects of this production have very TV-like staging – particular the short scenes, the unexciting character entrances and exits – hmmm. It would have been nice if Kate Bookallil had more to do. It would have been nice to see Prosper (Thuso Lekwape) one more time (loved that guy!) And I would have loved to have seen Maggie looking as aggro and fed-up as she is in the promos! Verdict: Clever writing, fine acting, overall look and feel not sure about. Written by Gregory Erdstein & Alice Foulcher. Fabulous! Crazy co-incidences! Wacky scenes where one twin arrives as the other leaves! Twins swapping clothes! Twins playing practical jokes! It was nothing like that. It was the character study of A TWIN. Note: 1 (one) twin. And she turns out to be a loser. Or does she? I’m not sure. The weird thing is that the second twin doesn’t appear until the end of the movie. 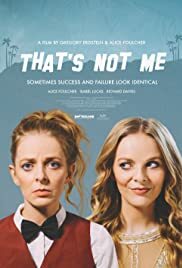 I don’t know why the script editor (not blaming you, script editor) or a kindly friend or gaffer or granny or SOMEONE didn’t say: Hey, this is a movie about twins, so shouldn’t there be twins be in it? Why is it that one of the twins doesn’t actually appear onscreen until 85 mins in? Didn’t anyone notice??? A nice character study of a confused late-twenties female but that’s not really what was promised. Such a missed opportunity. Well, it is about Venus de Milo! with script The Story of Wendy Vampire. Do Not Touch won the People’s Choice Award at Curve Gallery. And Lissy Shand won Highly Commended for her performance. From Tuesday August 22 to Saturday August 26, 16 short plays will be performed in coffee shops and an art gallery dotted around Newcastle. Intimate venues, chilly winter nights, wine and cakes and entertainment…what a great concept! My play Do Not Touch is on at Curve Gallery, performed by Lissy Shand and directed by Pearl Nunn.